Any critic who tells you that they walk into every movie totally unbiased is either a liar or, ironically, Robocritic (probably a liar). I certainly did not walk into the 2014 remake/reboot/redux of Robocop with a completely open mind. Not only is the director of the original, Paul Verhoeven, one of my favourite filmmakers, I consider Robocop his masterpiece and it has a spot in my Top 20. I've followed the news and the trailers for this film with trepidation and, frankly, pessimism, and was surprised when the first reviews came out and were generally positive. I still am, for the most part, but I can't deny that while it never becomes the film that I can see it might have been, there are flashes of promise and interesting ideas throughout this film and that it does, for the most part, attempt to come up with a genuinely new vision of what is now an iconic property. The cold open, the first of several sequences featuring Samuel L Jackson playing someone in a bad wig doing a bad Samuel L Jackson impression playing Bill O’Reilly, is something of a disaster. That said, this sequence becomes more interesting once it cuts into the story he is covering; the use of ED-209's and more human looking drones to police war zones. 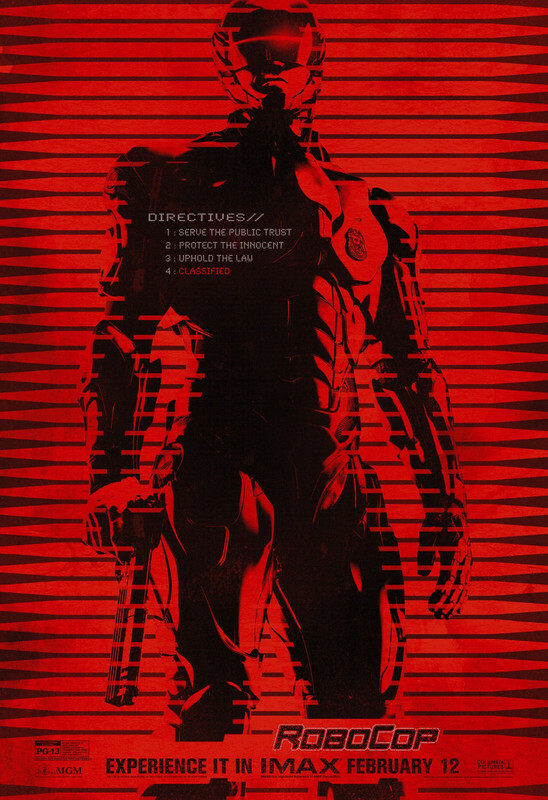 Here the film hits on its best idea, which is also the one with the most contemporary relevance, and the one that it completely throws away after this opening five minute sequence, because a movie based on this idea wouldn't be a Robocop remake (though it would, almost without doubt, be a better film). Thereafter the film follows the basic beats of the original film; good cop Alex Murphy (Swedish actor Joel Kinnaman, contributing a solid American accent) is badly maimed in the line of duty. The corporation making the drones, wanting to popularise their use in the US, saves Murphy's life by making him a cyborg. And then... it's called Robocop, you get the idea. There are two major story and tonal departures from the original film; first is the increased focus on Murphy's family life with his wife (Abbie Cornish) and young son. Secondly, the stripping out of the original film's vein of satire for a more serious and straight-faced attempt at social commentary. Neither of these is a bad idea as such, but neither is carried off especially impressively. One of the chief problems of the film is that the Murphy family just isn't very interesting. Cornish gets plenty of screentime as Murphy's wife, but she doesn't actually do much, or have any real personality; she's a pretty void, an attractive image for Murphy to hang on to. If anything Murphy himself is even blander, straight out of the decent cop character playbook. This is a huge problem because a major part of the film's commentary on our enslavement by technology is supposed to be in how Omnicorp strips away Murphy's personality bit by bit. The problem is, there seems to be very little to lose. The film does attempt some contemporary commentary. You could never accuse Verhoeven's Jesus metaphor by way of jokes about the Reagan administration of being subtle, but Padilha and screenwriter Joshua Zetumer's broad swipes at tech consumerism, the war on terror and Fox News feel like a sledgehammer to the skull because they lack the comedy, the irreverence, the balls to the wall sense of fun and abandon that Verhoeven and original screenwriter Ed Neumier brought. Where the original was mischievous this film veers dangerously close to preachy. This isn't to say that Robocop 2014 is a dead loss. Some of the ideas are, even if underdeveloped, interesting and there is plenty of value to be found in the eclectic casting. Kinnaman, sadly, is a plank; he's saddled with a dull character and seems devoid of emotion long before that's a plot point, but the Omnicorp based support does offer some compensation. I frequently wished that the film could have turned its focus to Gary Oldman, as Robocop's creator, who seems slowly corrupted by the process in what is a subtle and well developed performance. I suspect this would have made it easier to go along with the film's ideas and tone. Equally there's an interesting corporate thriller to be found in the performances of Michael Keaton, slimy but charismatic and a believable ideas man as the head of Omnicorp and a typically underused, but typically excellent, Jennifer Ehle as a high ranking and ruthless board member. The motivation behind Robocop is perhaps what this film is driving at, and it's at its best when that is where the focus lies. The way that this ends up hurting the film is that the apparent villain (the film's Clarence Boddicker of sorts) is almost completely anonymous, unmemorable and never seems any sort of credible threat, which makes the action of the second act a boring exercise in treading water. The action scenes are functional enough, but they suffer from the film's 12A rating, which means there is no blood and no dwelling on the idea that violence might actually hurt people. The rating is also, one suspects, why the action largely follows the scattershot fast cut shakycam style that is so prevalent in blockbusters right now. It never feels truly visceral. The final setpiece is a particular disappointment, with many moments that seem as though they could have been lifted from the computer game adaptation of the film. Design wise, the updating of the original film's look is a mixed bag. I'm not fond of the new visor design and the clean look of Murphy's face lacks the startling impact of when his helmet is removed in the original, but the updating of the classic chrome suit and ED-209 is strong, as is the design of the humanoid drones. More problematic is the 'tactical' black suit, which I still think looks terrible, and which makes Robocop a much less distinct figure in the action scenes. I get the function behind this; making him less visible is a tactical advantage, but he becomes hard for the audience to follow in much of the action, and that's a more important consideration in a movie. I feel bad for Jose Padilha, he's been given an impossible task here. Studios should remake films that didn't work the first time around. Robocop 1987 is critically acclaimed and enduringly popular, well on its way to classic status... take yes for an answer. Instead, we have this. There are enough interesting ideas here that I suspect Padilha is better than this film, but from the rating on down Robocop 2014 feels like filmmaking for a focus group; you can have ideas, but don't challenge people too much. It feels press-ganged enough that I wonder how happy Padilha is with the film, and what it might have looked like with a freer directorial hand. 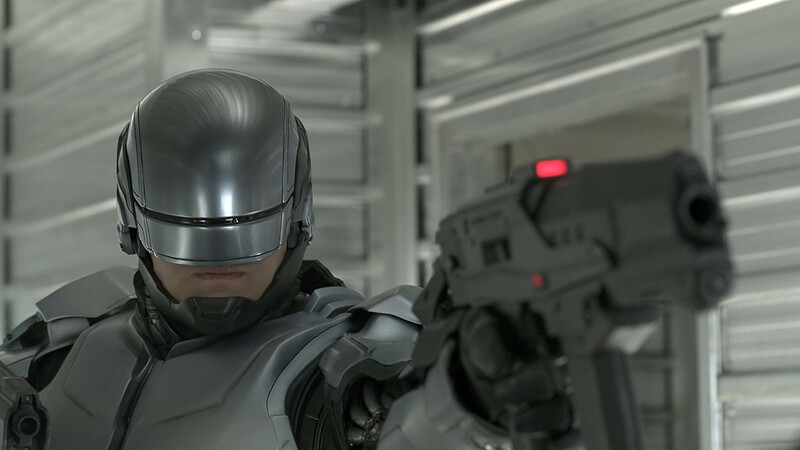 Ultimately Robocop is a better film than I thought it might be, but that's not saying much. My praise can still only extend to 'it's not terrible', it doesn't hold a candle to Verhoeven's film and at its absolute best is an exercise in underexplored ideas.